London - Jurgen Klopp says the transfer market is not the magic solution to Liverpool's defensive woes after familiar problems returned to haunt his side on their return to Champions League action against Sevilla. Dejan Lovren's slip allowed Wissam Ben Yedder to score early in Wednesday's match at Anfield but goals from Roberto Firmino, who also missed a penalty, and Mohamed Salah appeared to have put the home side in control. However, with 18 minutes to go the defence switched off and Joaquin Correa equalised. To compound Liverpool's frustration, Joe Gomez was sent off in added time for a second bookable offence. The Reds, who lost 5-0 to Manchester City in the Premier League at the weekend, were heavily linked with Southampton centre-back Virgil van Dijk in the summer but had to publicly withdraw their interest after a tapping-up row. With Saints refusing to sell at any price it was an area of the team that was not strengthened and defensive lapses - not for the first this season - cost them as Sevilla scored from their only two shots on target. 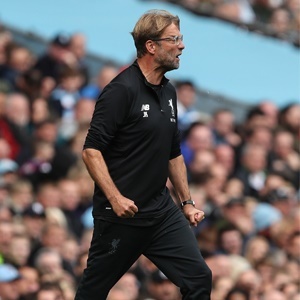 "I know you are always looking for this thing - the defence was always something being talked about: 'We didn't sign this or that'," said Klopp, whose side was returning to Champions League action after a two-season absence. "If these problems could be solved by one player you can imagine we would have put all our money into it and say: 'Let's do this'. "It is about being dominant and losing a bit of a grip on the game in all the defensive moments." Klopp said there was room for improvement and that his players needed to learn to be dominant and not give away easy goals. "It is not a general defending problem but we have to improve 100 percent," said the Liverpool boss. "It is disappointment, frustration, but that is completely normal," he added. "We are responsible for the very good parts in the game and also the not-so-good parts so you have to feel disappointed after a game like this."